I was recently gifted with a beautiful Shagai set by a friend who picked it up in Mongolia. I have also noticed a few folks offering professional Shagai readings, so I decided to do a quick blog post for those who are interested in this type of bone reading. Shagai is both a game and a divination method from Mongolia. 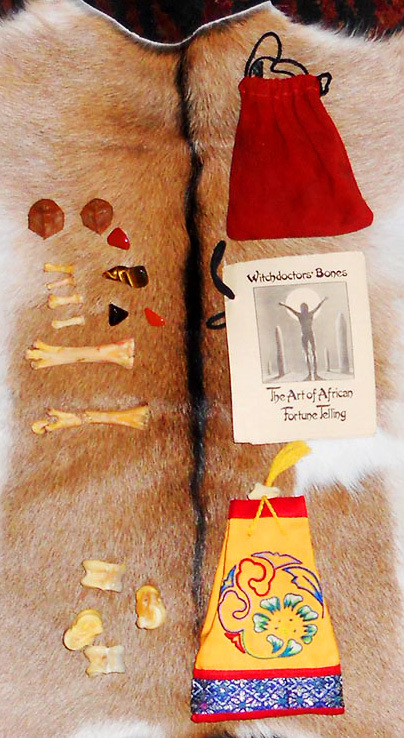 The divination method uses four sheep astagalus (ankle) bones. Each bone can fall in one of four ways since each bone has four different faces. The four faces are called goat, sheep, camel, and horse. The four pieces can fall one of 35 configurations that are assigned meanings. They are very well suited for simple yes/no questions. I think that the limited number of possible meanings could be made up for to some extent by skillful questioning. I got my first Shagai set from Lucky Mojo several years ago. This set has a hand embroidered bag and it is from Mongolia. The bag drawstring has a bone pull as well. This type of set is no longer available at Lucky Mojo. They sold out a long time ago. I got my second set from Lucky Mojo as well, in the past year or so. It has deer astragalus bones instead of the traditional sheep bones and was made here in the U.S. The deer bones are significantly larger and I am assuming that deer bones were used because they are more readily available. At the time of this writing they are available per the site catalog. My newest set is from Mongolia and has a leather bag and a small throwing surface. There are two books that I know of that discuss how to do divination with Shagai – Throwing the Bones, by catherine yronwode, North Asian Magic by David Shi, and Riding Windhorses: A Journey into the Heart of Mongolian Shamanism by Sarangerel. If you have an iPhone or iPad there is also an app that will do Shagai readings. It can be used for readings and it could be used as a learning aid as well. Shagai is less complicated than Sangoma style bone reading, but in skillful hands I think it could be quite useful.